The 10 Best Lunch Spots in South Carolina! Stuck in a PB&J lunch rut? If so, it’s probably because you haven’t experienced the culinary diversity in South Carolina. If there’s one thing that South Carolinians do well, it’s food. From international flair to deep-fried everything to flavor combinations you’d never think possible, you’ll never have to settle for the basic peanut butter sandwich ever again with South Carolina’s lunch scene. If you’re not hungry now, you will be by the time you discover these 10 best lunch spots in South Carolina. This “farmhouse chic” café specializes in locally sourcing ingredients to bring you a fresh look at what fresh lunch can be. Here you’ll find fun combinations like their arugula, tart cherry and pumpkin seed salad, a variety of quesadillas, organic tempeh, falafel, and portabella burgers. Croissants is the perfect destination for a lighter fare lunch that won’t weigh you down as you trek through the rest of your day. Their menu includes a healthy variety of fresh salads, fruit, sandwiches and soups that taste every bit as good as they look. The onsite bakery is an added bonus, as you can sate your sweet cravings before you leave. If you’re craving variety, go grab a seat at Atlantic House Restaurant. Their menu features many traditional lunch staples, along with not-so-common items like chutney, portabella mushroom sandwiches and burgers, jalapeno pimiento cheese, and frogmore stew, to name a few. 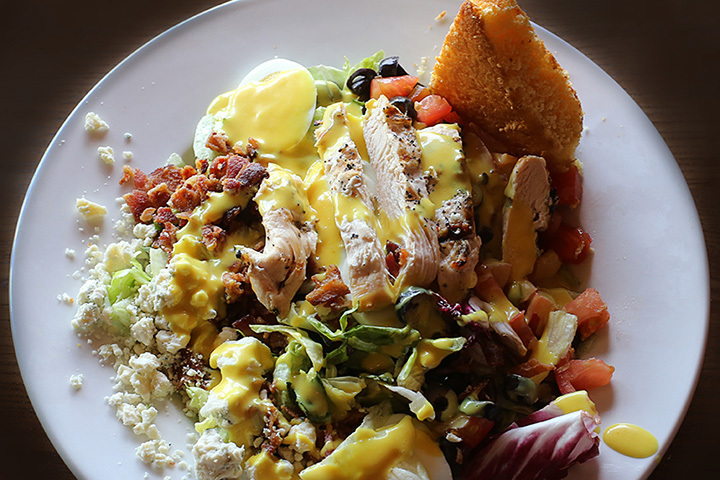 If you’re looking for a delicious deal, head to Village Deli & Creamery. Their freshly-made Boar’s Head sandwiches and paninis are so big many visitors can usually get two meals out of each. Reminiscent of a New York-style deli, they’ve got a large variety of classic and unique lunch meats and toppings, along with homemade chips and French fries. And their hand-dipped ice cream puts the cherry on top to a tasty lunch. Locally sourced ingredients, in-house roasted lunch meats, hand-prepped pizza dough— could it get any fresher than Summa Joe’s? Not likely. Aside from high standards for freshness, this lunch spot has created an eclectic variety of lighter entrees to sate your midday appetite. Here you’ll find delicious, offbeat offerings like shrimp cakes, horseradish beef crustinis, chicken cordon bleu, gyro wraps, and plenty of other delectable that can transform your lunch to an extraordinary culinary experience. Who says fine dining is only for dinner? Vangeli’s Bistro has changed the concept of lunch as most people know it. They deliver an upscale dining experience tailored for a middle-of-the-day meal, featuring fun dishes like braised lamb paninis and blackened shrimp wraps. The menu isn’t as diversified as their dinner offerings, but it’s certainly a welcome relief from the typical burger and fries. Dining out doesn’t have to kill your diet, especially with clean eating-focused restaurants like Magnolia. You can rest assured that whatever you order is health-conscious. They offer foods for organic, gluten-free, and non-GMO diets, and take pains to make many of their sauces, breads, and other items in house. On the menu you’ll the find likes of cedar plank salmon salads, turkey burgers, hot and cold sandwiches and wraps, flatbread pizza, and hummus. Aside from the yummy eats, Lulu’s Café features amazing ocean views that can easily turn your lunch hour into a midday vacation. This little family-style diner serves a balanced variety of soups, salads, sandwiches (including four varieties of grilled cheese! ), and the best fried pickles in the city. This farm-to-fork eatery gives you a straight-from-the-farm taste. Sourcing local, fresh ingredients, The Farmer’s Table revitalizes traditional offerings like burgers and sandwiches, along with offerings like hummus, seafood tacos, fried green tomatoes, and pulled pork barbeque. You might be waiting a few extra minutes for your meal here, but that’s because you can’t rush perfection—and it’s well worth the wait. This Italian-style deli is a favorite among locals and travelers to the city. They feature delicious sandwiches, salads and soups that are perfect for a dine-in meal or to take back to the office. With a diverse menu, you could eat here for lunch every day for a month and get something different—and once you take your first bite you might be tempted to do just that!